The race has already begun, we’re all still together, picking our place in the herd of a fast-moving, 51 strong 3/4 field. 25 miles in. Our kits are so bright, I don’t have to turn my head to see anyone. Alex easily sinks into the middle, covering Julie. I can’t always put my finger on split second impressions, but the way she was riding I would not mess with Alex. Move out of her way; like she would give you a choice. Punchy hill, splits field. Stay with Julie. Lydia loses her chain and is swept away as we charge forward. I finally see Cindy, she wonders if she should lag back and wait. I say ‘No’ she will be fine, plus Lydia is friggen watty and tenacious. Almost hill time, Julie moves up, Cindy follows her, just as the door closes on me. I’ve missed it. I am mid-pack for the rest of the race. Lydia shows up, chased back on. We try to move up, but there’s no opportunity, everyone is an inch apart waiting for the climb. Then, we see Cindy (who is one of the shorter team members) TOWING THE ENTIRE FIELD in front of Julie. I hear Alex’s voice behind me before I look down at my Garmin and wonder ‘ Is this it?’ Lydia shoots forward as the pack falls apart, chasing Julie. Cindy falls back. I try and just survive because the fastest time up is 15 minutes, or so I am told. (Regina from GLV did it in sub 13 minuets). Just grind and spin when possible. I latch on to a Stans No-Tubes lady. So.Much.Power. Made it over, I can’t see Lydia or Julie. Stans lady proposes we work together and pick off a few. We go, bombing along the hairpin turns and small hills. Finish line, she sprints, I fall in behind. It was over and it was exhilerating. Julie 4th, Lydia 18th I am 25th, Cindy is 30th and Alex 38th. We showed up and raced. I see so much improvement and potential in my teammates; next year looks even more exciting. Until then, like clockwork we will show up, race, repeat. Saturday’s event was awesome. Blue skies, 60 degree temps, and over 100 women prepping their bikes for what was going to be a fun, challenging race. It was B2C2’s first time racing together as five of our women staged for the 3/4 race, nearly half of our women’s team present. The first 25 miles we stayed together as a pack. It was awesome having teammates all around. Going into the climb, Cindy flew past and hopped confidently on the front of the pace line. Awesome. What wasn’t so awesome is that I let a small gap open between her and I, and two teammates from Green Line Velo filled it. As soon as it started to turn upward, I was in 6th. I decided to ride at a conservative pace I felt I could carry the whole time without being afraid of blowing up, a feeling that had occurred on training rides earlier in the week. As two of the girls started to pull away, I moved up into 3rd. I didn't know one of the girls in front of me. Although I should have been afraid of her, I wasn't. I thought they'd crack on the hill and I'd be able to beat them if I stayed consistent...unfortunately that didn't happen and they got away. It ended up being just me and Lucie V, to whom I lost in a sprint finish at the Army Spring Classic earlier in the season. On the hill, she suggested that if we come over it together, we work to the finish. Knowing she’s a way better sprinter than I am, I tried dropping her at the last turn on the hill. I couldn’t. Once we got down the hill, I led most of the next 4 miles, debating whether I should go hard, risk blowing up, and try to drop her or stay with her and end in a sprint finish. On the only uphill tick I had a small gap on her - three seconds, but ended up waiting - bad choice? Going into the final turn, 500 meters from the finish I tried to pull off so we'd be side by side. Of course, she's smarter than that and stayed behind me until 100 meters from the finish and powered by me. She got 3rd and I got 4th. She came up and offered some advice after the race - that I be more selfish when racing. Lots of lessons learned: Strategy is a big part of road racing I need to learn better; being aggressive and selfish is good in a race; confidence matters and I didn’t have it at the start line or on the hill; sprinting is for winners; riding conservatively up hills is not for race day; but most importantly, racing with teammates is fun. B2C2 has a solid group of women who have reason to be confident on the bike. We’ve got a wide range of skill level, but none of that takes away from our ability to have fun and challenge each other in a road race dictated by one long climb. I had never lined up for a road race before with four other women in a matching kit. That extra drive - the motivation that comes from knowing someone else is expecting me to be there - had been absent. I am pretty determined on my own, so I never realized how strong it was, but that force is real and had me aware and excited on the start line in a way I had not experienced before. Going into this race, it was no secret that I had the most road racing experience of our group, but this felt like an entire new game. I was unfamiliar with what the expectations were for our team, the most heavily represented team in the field. I didn’t know how we would leverage our very different skill sets and strengths to pull off a result. Once we got riding, none of it mattered. We were compact, sitting in two pace lines, each teammate directly in front of or directly behind one another. I’m fixated on Hannah’s wheel, her legs going around in perfect rhythm, and what lies just beyond her shoulders - the start of the first climb. Clank. Crunch. Snap. Chain is off. I’m now at the base of the climb at mile 15 of 32, and I know this is the first moment the strong riders in the field are planning to test the waters. And I’m at a dead stop. I struggled to get my chain back onto my bike in any gear other than the 52 x 11. I look up and see a few stragglers, but the field is gone. My teammates are gone. I hop on the bike and the pitch is steep enough that I lift my front wheel off the ground with my first pedal stroke. I get comfy in the drops and start flying up this wall of a hill. My legs are on fire. I’m blazing past girls still making their way to the top, only thinking about one thing: gotta get to my teammates. Five minutes later, I’m safe in the draft of a diluted but still large field. I’m wasted. I see Cindy on the front, in perfect position to keep Julie exactly where we need her. I am overjoyed and impressed and so grateful that I can sit in and try to recover. Coming up to mile 23 or so, I know it’s time to get to the front before the main climb. I struggled to find a way through the back of the field on the narrow New York roads. I signal to Hannah that we need to get to the front, but offer no idea for how to do so. We round a corner that I recognize from our warmup ride; we’ve reached the main event. Immediately, the pace quickens and holes start opening up left and right. I start moving through the field, picking my line carefully but aggressively. I make it to the front and there is Julie, riding away from me up the side of a mountain. I’ve seen this sight before - in training. I start hammering on the pedals at approximately 55 rpm. I look down and I am out of gears - this can’t be good. I’m passing people, people who I know are stronger than me. I pass Natasja and wonder if I’ve managed to bruise her seemingly iron-armed ego. I keep going. And then I know that I’ve gone out too hot. I fight the bike the rest of the way up. I’m getting passed by all the women I left behind in the previous mile. I reach the 1km mark. The flies are buzzing around my eyes, my ears, getting caught in my sweat. 250 meters to go. I’m over the top and chasing four women in my sight. I catch with three miles to go and I sit and wait. We approach the final turn. It is slightly downhill into the finish. I see the two Rockstar riders line up but I’m not inspired by their organization and decide to risk it. I swing left and jump. I’m kicking. My mouth is wide open, jaw totally rigid. I’m at the line. I look up and I’ve got it. Hannah, Cindy, and Alex charge into the finish before I’ve had a chance to fully recover and I’m just elated that we all came out to give it what we could, to lend each other a wheel, and to begin to understand what it means to race as a singular unit. Throughout the long drive out to the scenic Catskills Friday, the team dinner and meeting at teammate Julie’s wonderful parents’ house, and the pre-race morning routine on Saturday, I felt the low rumble of doubt reverberating through my core. I had not done a road race in about two years, and only a handful before then. I had sworn off the kind of hilly race I deemed myself “bad at.” The Women’s Woodstock Cycling Grand Prix was one of those hilly races. What was I doing here? But who can say no to a high-quality event like this, organized just for women? After fighting for equal payouts, and sometimes even just for a field to race in, the relief I felt at just being handed a fantastically polished event was the size of an ocean. And who can say no to a crew of enthusiastic new teammates, thrilled to race together for the first time? Having strong women to work with helped draw me out to New York. Having women this supportive and excited about cycling cemented the decision. I was going to race. Rolling with a crew garners respect, I guess, since we were able to hold on to the position we had targeted in our pre-race meeting: near the front, but not on the front. Having wheels I could trust surrounding me boosted my confidence. I felt ready to go hard to do what I could to help my stronger teammates. The long, miserable winter on the trainer apparently paid off: I found myself in solid contact with the group after the first punchy climb. This is not a thing that had happened before. I swallowed my excited exclamations so as to not give away my thrilled/confused state. My legs felt good, but I knew staying with the leaders over the BIG climb coming up isn’t in my skill set. Poor teammate Lydia, a gifted climber, had dropped her chain at the first climb; I wondered if I should use what I had in the tank to drop back and help her catch on. But Julie, another very talented climber, was right there with me, rested and in a good spot. I stuck with Julie until I saw her move up toward the front as The Climb drew nearer. I went with her to make sure she had at least a Cindy-sized shield delivering her to the base of the hill. We hit the hill, my time in the wind ensuring that all I could do was putt-putt along at a steady, not-fast pace. Using the one cycling superpower I have - dieseling along at a steady pace - to help my climbier teammates was terrifically rewarding. Julie managed to pull off a fourth-place finish, while Lydia nabbed a paying position in the field sprint despite the work she had to do to catch back on. Hannah and Alex were so instrumental to the team’s success. What a great feeling to be a part of this! 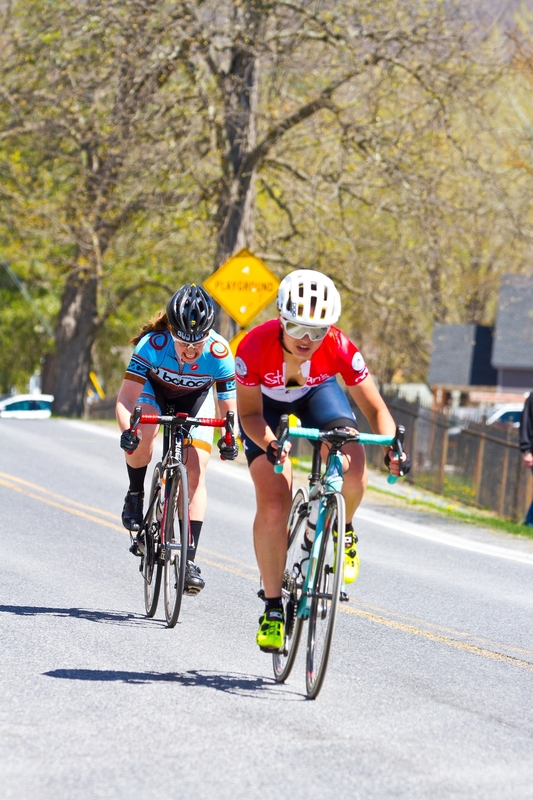 As crazy as it sounds to say, the B2C2 ladies and the wonderful organizers of the WWCGP might have just convinced me to enjoy hilly road racing. And I can’t wait to come back next year. 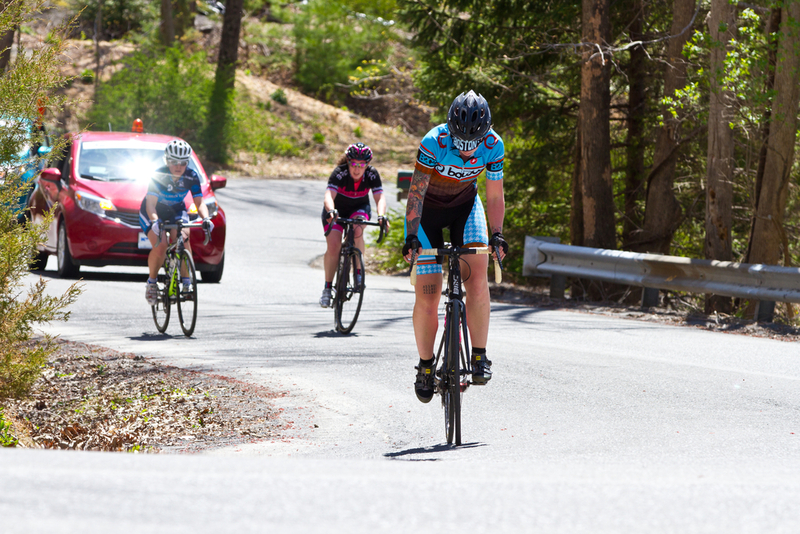 Fifteen miles in we hit the first climb at the Woman’s Woodstock Cycling Grand Prix. Fifty-four women shot up the incline as the group began to get strung out and splinter. Lydia had suddenly disappeared from my sights, which threw me for a loop as I had settled into riding her rear-wheel up until that point. With no teammate within reach to follow I punched up the climb knowing this is what broke me away from the group the previous year. I was trying so hard to spin through my breathing. I was drooling over the front of my bike. As the climb tapered off I felt how spent my legs were but my mind didn’t want to believe my legs or lungs just yet. It turned out Lydia had dropped her chain at the base of the hill and she came shooting past me yelling to get on her wheel and chase back to the group. I couldn’t get into gear quite fast enough to catch her, but began working to regain ground. I was actually passing people getting back to the lead group. A voice from behind me asked if I needed a tow and looked back to find Audrey from BRC and another girl drafting me. Audrey took over the paceline as we traded position for a mile or so. I saw the lead group and made a break for it, carrying all of us to the back of the pack. After a few minutes of fighting through the back of the group I was back on Lydia’s wheel. I couldn’t believe it. At this time in the race last year I was enjoying the rolling farm scenery by myself, thinking I had somehow gotten lost. This year I couldn’t even fathom taking my attention away from the pack I was in and making sure I was within a wheels length of my team. Mt. Overlook, here we come. Looking back on it, It’s funny a mountain snuck up on me. I was overtaking the course at a pace so much faster than the previous year I hadn’t expected to hit the base of Mt. Overlook so soon. I had to stop twice on the way up. When I got to the QOM marker I gave a celebratory kiss to the sky and ripped down the back of the mountain. Having lost my teammates, I soloed for the rest of the race and came across the finish line thirteen minutes and eleven seconds ahead of the previous years time and placed much higher in the pack. Julie had come in 3rd for the QOM and 4th overall. Lydia came in at 18th, Hannah 25th, Cindy 30th, and myself in 38th out of a finishing field of 51 women. I woke up the next morning reflecting on my year of racing bikes. The thing is, I personally have a hard time accepting that I’m good at the things I invest myself in. I’m a designer and constantly battle with my projects and spend a lot of time stressing about the quality of my work. It’s no different in cycling. I feel like I’ve read a lot of woman writing about their feelings of shortcomings or being ostracized in sports. There’s a lot of self deprecation; girls who say they aren’t fast enough or strong enough to deserve a nicer bike or better equipment. In my case, I was even afraid to join a team for fear of ‘slowing everyone else down.’ I woke up and looked at my road bike and my cross bikes and my tools and my nice shoes and my team kits and thought to myself that I wanted all these things and they were my tools to do better in my life and of course I deserved them. I hated sports growing up. I had asthma and I was a little overweight. I couldn’t run a mile without crying and I had some fairly deep-seeded image issues around how my legs looked. I wore long pants year round no matter how hot it got because of how self-conscious I was about my legs. That continued until I was 20 years old. After I came back to Boston to finish college, I opted to get a bike instead of trying to deal with my car. I got a 1970’s schwinn road bike for $80 off craigslist. It didn’t really shift and it was too big, but it was bright yellow and got me around the city. After a summer of riding that rust-bucket around, I got a cheap single-speed that opened up a whole new community for me. I started learning how to fix simple things on it, change a flat, ect. I added shorts to my wardrobe. I started going into Back Bay Bikes which eventually led me to start working there. This self-conscious girl who didnt get sports, suddenly started working at a bike shop full of people who taught me and supported me. Sometime that winter I had a strange and unexpected epiphany. I don’t remember how I came across it, but I saw a picture of Rochelle Gilmore posing with her bike for team Faren-Honda. I had no idea who she was but as I looked at her picture I heard a voice in my head say “why cant that be you?” So I started looking for a road bike and sure enough the bikes I wanted were expensive and I was reluctant to spend any money because I figured I’d be terrible at bikes and would waste my money. Luckily I had a lot of help from the shop to dissuade that notion and point me in the right direction. I even secretly joined a local bike team at the beginning of the season to which the shop team talked me out of and into joining them. I had assumed B2C2 wasn’t interested in beginners and I didn’t want to slow anyone down or get in the way. Pro Tip: Don’t ever think that way. You’ll get better results if you just ask and in my case get an entire team of rad people who actively WANT to help you improve. I didn’t end up racing much road that year after sustaining an injury to my upper back, but I did join into the CX season. I hemmed and hawed a lot before actually registering for a race. Again, I was stuck in the mindset that I would crash everyone out, hurt myself, get lapped, and generally be embarrassed. Once again, my teammates pushed me gently to understand that we all have to start somewhere. At the Canton Cup CX race I crashed almost immediately at the first run-up but got straight back up and finished 43rd of 53. I didn’t hurt myself (badly), I didn’t crash anyone out, and I wasn’t embarrassed; I was insanely proud of myself. Over the next ten races I saw myself go from the bottom 25% to the top 50% and had a top-ten finish. I was equally proud of all the races I did, including the two I DNFed. As a passionate CAT4, I show up and I tried my best and I learn every time I get out there. I learn from my team every time I get the chance to ride with them and on every discussion we start. Cycling has introduced me to some of my favorite people and having them there as mentors and friends never ceases to amaze me. It’s also let me weed-out the people who didn’t believe in me. It hurts that their are people out there that can’t respect your success or want to see you fail. My wisdom to anyone facing that is don’t waste your energy. A rising tide should raise all ships and It’s not worth holding onto negativity. Don’t let anyone, including yourself create doubt in your abilities. Get the bike you want. Do the races you want to do. Get involved. There’s still a lot of inequality in sports but it’s starting to change. We as woman deserve everything we work for. We deserve equal coverage in the media, equal pay-outs, the same price and quality in the products we use. For me though, all that goes hand-in-hand with learning how to treat yourself equally. I’ve fought this year to respect myself and the sport I participate in. I’ve spoken up when I felt mistreated and have been heard. I’ve worked all year to come back to Woodstock and exceed my expectations. Mission accomplished. Cycling makes me feel beautiful, accomplished, athletic, strong, like I’m a part of something. Because I am a part of something. To any girl who might read this who doesn’t feel capable, this is me telling you to try anyway. It might not happen overnight, but I promise you’ll surprise yourself.